Discussion in 'Announcements' started by Mistri, Feb 2, 2019. Hello everyone and welcome to another new year at Shotbow Like last year I’d like to share some plans with you that we have for 2019. But before that let’s talk about 2018 and how we got on with our ambitions! After an absolutely staggering response, with 48 teams registering their interest, the tournament began in earnest in March 2018 with the last quarter final match playing out in June. It was an absolute joy and pleasure to spectate and commentate on all the various tactics and strategies employed by the teams and to see how truly effective an organised clan can be! This was the first tournament our staff team has run, so we have learned plenty for any future events we put on. As you may have seen, we held the final of January 26th 2019, which you can see here. The reason for the delay was due to several factors but ultimately I felt it was best we kept going and finally played that last match for the teams who had earned their chance to be crowned champions! The long awaited team balancing mechanic made its public debut back in December of last year and we’re very happy with the initial results. There has been some suggestions to amend the system to try and be even more fair to players in later phases of the game and we are discussing these internally. We were very happy to release the PvP update to Annihilation much early than expected, thanks to Doc's work on tweaking the PvP in MineZ. We will always strive to emulate 1.7 / 1.8 as closely as possible and we will continue to mirror any changes from MineZ in Annihilation to ensure we offer a better experience for our players! During the summer of 2018 Shotbow suffered a massive attack from several groups who crashed servers using methods to overwhelm the processing capabilities both ingame and externally. Whilst external efforts were somewhat mitigated by our host at the time our entire development team were tasked to prevent the ingame crashing caused by these exploits. This in turn severely delayed our efforts on Gold Rush, Wasted and MineZ Origins Part 2. These exploits were sadly not just limited to Annihilation and could have been easily replicated in any gamemode. This made us hesitant to release Gold Rush as we wanted the gamemode to have a fair chance of being played without a bad experience of connectivity. Despite delays to the release of Origins Part 2, Doc worked tirelessly on MineZ over the past year and managed to release several updates to our oldest and most iconic mode! Given how old MineZ is Doc took it upon himself to recode the entire gamemode from the ground up - no small feat! This meant that not only were there big performance increases but it also allowed the team to crush some longstanding bugs, implement new features to improve the quality of life of the game (dungeon instances as one example!) as well as many, many more. A full explanation can be found here. As mentioned previously the PvP was updated to better reflect 1.7 / 1.8 combat. Doc along with the rest of the MineZ team continue to refine and tweak PvP and are still keen to hear from more players in the community about all points of view on it - good and bad! This project was being headed up by SocomX1 who sadly left us early on in 2018 due to commitments in real life. As such, with our limited development resources, we had no-one to take up the project in his absence. We are still looking into this project as we feel it's important to our future to ensure a community space for players of all sorts. For the coming year we’re happy to announce that Gold Rush is now ready for a long weekend open test. This will be to gauge the community's enthusiasm for it and get your feedback to help shape the future of the gamemode. We’re planning to host this long weekend in the coming weeks, keep an eye out for future announcements! There are several small updates to Annihilation currently in the works. Most are quality of life changes but will also include some tweaks to underused classes to bring them in line with other comparable classes. With the conclusion of the tournament the team is considering another one and are keen to hear what we should do differently this time round (we've learned quite a bit from the past year!). Doc has released a revised schedule for MineZ for the coming year that you can read all about here. Red_Epicness is continuing his SMASH-ing work redoing SMASH from the ground up as his first project on Shotbow. We hope to have some early tests ready to go this year for you all to see! Last year we briefly blocked connections from players on VPN’s and proxies to help counter and reduce the impact of the attacks that occurred during summer. After further discussion internally it has been agreed that will re-enable this restriction again to aid our administration teams. We apologise to players who utilise a VPN for legitimate reasons but sadly the pros greatly outweigh the cons. Our development team continues to update our backend infrastructure with support from DDG to increase our stability, resilience and ability to quickly troubleshoot issues with some major changes behind the scenes due this year. Over the past year it's became increasingly clear that we've not been living up to the expectations of our players with respects to the support email. This has been hampered by both myself and HighlifeTTU becoming increasingly committed IRL with matters, reducing our available time to respond in a timely fashion to players who need our attention. We are deeply, deeply sorry for this. To this extent we have revised our pathways for the most common requests and have created two google forms - one for disputed payments and one for rank upgrade requests - to capture all information required, allowing us to reduce our time spent asking for details to progress support tickets. We have also released two new balloons to our Emerald and Obsidian players as our way of saying thank you very much for your patience and support over the last year. Starting this month we have also decided to archive all outstanding requests and start afresh. If you had not yet received a reply to your support request we would kindly ask you to resubmit - please use the google forms above if they are appropriate for your enquiry. This month marks our 7th birthday - quite the impressive feat! Thanks for flying Shotbow, see you all ingame soon! Hey Shotbow! Hope you enjoyed the letter from the leads. I'm here now to tell you all about this last month's updates in Dentril's New Moon. To celebrate our our 7th birthday, we're adding a +7x XP multiplier for one day! Join us on Wednesday February 6 for an XP-filled day! This month we completed our Annihilation Spring 2018 Tournament (now renamed to the Annihilation 21st Century Tournament), and the results can be found here. The livestream is now available online and I was on the edge of my seat watching this thrill-inducing game — I would highly recommend watching it if you have a few free minutes! At the beginning of the month, we ended our hiatus to MineZ Revelations, our podcast, by releasing the 4th episode. It's pretty well produced, so check it out here! And more recently, just a few days ago in fact, Doc released the February monthly announcement thread that went over the tons of updates that happened to MineZ: including the release of the Re-Code update! You can read all about it here. Last but certainly not least, SMASH had its 6th anniversary this last month! In celebration, old game mechanics and lobbies are back to bring some nostalgia to old players. Read all about what happened here! With that, I bid you farewell. I'm your host, Mistri. Please let us know what you think about the New Moon in the comments. Thanks for flying Shotbow! Unhinge, jiren74, _Swipe and 17 others like this. It's nice to see all the new updates for shotbow coming out. I've noticed that the playercounts (at least by looking at the max on recent months) seem to have stabilized, and that's definitely a good sign. I'm also really excited for both goldrush and the mineZ updates, and I feel like the majority of players think that as well. I wouldn't be surprised if when goldrush comes out for the first time the playercount on shotbow jumps! DutchBartje, Alluminator, Fluffoon and 2 others like this. Nice work on the MineZ updates, can't wait on the map changes now! Did any of the variables for combat change in these vague PvP updates? I'm asking because I want to make sure my combat calculator is up-to-date. Well it's bringing in new players. 10 Anni classes in the last 3 months. Makes me think new players should get a few free classes since it impacts player counts so much. Still no news about an mta update ._. The event will start on the 6th in Tokyo and end on the 7th in Los Angeles. Nothing will bring new players here, you've killed your biggest game - anni and few smaller ones. Each game used to be good, but now it's unplayable. Are you complaining about any one thing specifically or do you just like complaining? Mistri and Fluffoon like this. 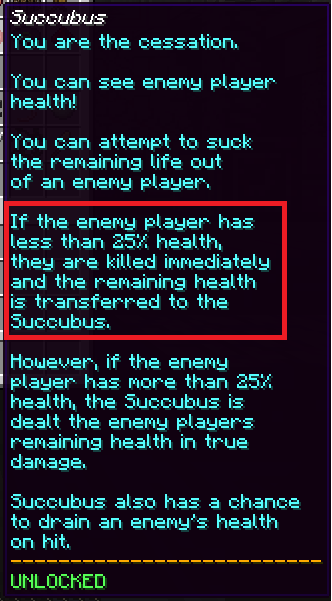 So how much health should player have to successfully kill him with life drain? Huh? Is anti-cheat a joke? 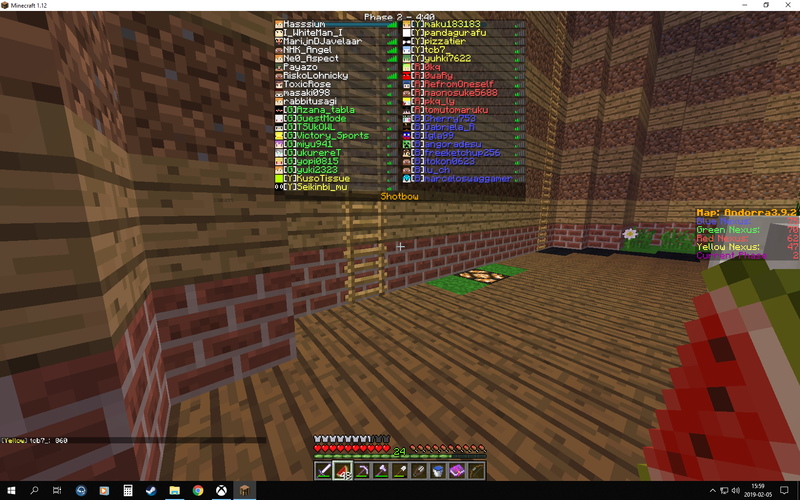 Cheaters can play as much as they want and do whatever they want, when I'll be moved back on stairs/slabs becouse of it. In a few years you've lost thousands of players, you had good US and EU server and now you only have poor US server that struggles with max 200ppl online. You had huge player base and now you don't. You and noone can't explain that loss by saying that people grew up. If older had left, youngers would have come, but somehow they don't come. In my opinion minecraft combat updated (1.9) and few of your changes destroyed some games. I really wish this server all the best and I'd love to see it as good as it was five years ago. Of course I love complaining. Igla99, you mention a bunch of things that you think they've done wrong, but they did all of those things for a reason. They can't keep every server open because there is both not enough money to host all of the different game servers and not enough devs to code them to work in the newer versions. While you say the 1.9 shotbow update was a bad idea (I do kinda have to agree) it was because it was getting harder and harder for the devs to make the games playable on every version. You say that they can't refute this by saying they've grown up because younger players didn't come, but I have to say that I think you've missed how java edition is dying right now, and every server is losing players right now. You don't propose solutions, you just say that you hate the actions that were necessary because of lacking resources. Kelestami, _Swipe and Fluffoon like this. No, anti-cheat isn't a joke. It bans a good percentage of our total bans, and we ban thousands of accounts a month. Ask any server owner and they will tell you that it is impossible to block every hack with just anti-cheat without using something super expensive like having to have a certain client to play the server. Along with this we always deal with most of our reports, and we are always looking/adding new members to our staff team. Sometimes the grapple wont work if you dont let the grapple set, or if you have poor connection issues. I have never had my grapple not work while having good ping and let my grapple set. I have personally not used acrobat in a while, but I have not seen players lately fly a huge amount with Acrobat, and Assassin's leap is pretty consistent but may not work well if you have poor connection. There's not much that we can do there. Many players believe that classes are the most balanced in years. Does that mean every class is balanced? No. There are still some that are under-powered or overpowered, and we take suggestions from the community and discuss internally how to fix these. In a few years you've lost thousands of players, you had good US and EU server and now you only have poor US server that struggles with max 200ppl online. You had huge player base and now you don't. You and noone can't explain that loss by saying that people grew up. If older had left, youngers would have come, but somehow they don't come. In my opinion minecraft combat updated (1.9) and few of your changes destroyed some games. Our servers do not struggle with a max of 200 people online. We had about 400 players on a couple nights ago and had no server crashes and no games with low tps. We lost most of our players during our transition to 1.9, not after. While we were transitioning we unfortunately could not update our games as the dev servers were all on 1.9. Not to mention 1.9 was a huge task to take on due to Mojang changing how everything worked, and it took much longer than expected. We had delays such as Mojang forcing us to change our entire premium system, and developers leaving due to real life catching up with them. This caused a good majority of our games to lose a huge amount of their playerbase along with our age group moving on. We basically lost the German Smash community due to a sign bug that could not be fixed until it updated to 1.9. After we updated to 1.9 we were able to push out update on top of update, and we managed to keep our playercount stable until our servers were attacked both externally and internally this summer. During this time we were peaking in the low two hundreds, but we fixed that and have gone back to the four hundreds. Recently we have put out a ton of updates adding new content to our games and increasing stability. We have huge plans for the network this year such as Gold Rush and MineZ origins, and we can't wait to see what the players think going forward. Kelestami, Fluffoon, Mohawk2 and 1 other person like this. The answer is 30% of their health. The shotbow site is wrong, the in-game class says wrong, the in-game chat is correct. 4 is what you normally see when someone has normal 20 health (10 hearts), which 30% is 6.0 health. 3 is a case of a berserker. They actually had 16 health (8 hearts), which 30% of that is 4.8 health. This is accurate. It just means you need to be more careful. But I'm not about to say 1 and 2 are fine. They should definitely be fixed, since it can cause some serious confusion when someone first tries using the class (especially when it says 40% on the website, that will screw people over if they take that as fact). In fact, there are multiple that need to be updated (on the website specifically). I'd love to just tell you to 'read the wiki', but that's also inaccurate (says 30%)! And we can't edit it right now, so we're a bit stuck there (wonder if an admin who can edit it is reading this). Definitely needs fixing, but until this stuff is fixed, you can't really do much except make sure people know what the actual percentage is (which is 30%) or keep asking admins (nicely) to fix it. More forcefully if you feel it's taking too long (it's ok to be mad, just don't take things too far). Could be that they're looking to update and lumping text changes with it, who knows at this point. _Swipe and Igla99 like this. For the wiki.. we're replacing it in full. There's a team working on the MineZ side but I don't think there's as tight knit of a group for the Annihilation side. Kelestami, ArsMagia and Jarool like this. Lol right now i'm trying to play coastal game and whole teams were kicked 2 times in 10min. Edit: Red somehow managed to avoid it and now destroyed 2 teams gg. Server TPS seems like it was fine. By the looks of it several players did leave the network around that time which generally means there was something external like a DDOS attack or just a lag spike. These are not that often and are especially not caused by high playercounts because last night was nowhere near our peak times.